The Alternative Energy committee is working to rapidly expand solar power through a Solarize MDI group purchase initiative, developing community solar farms, and educational outreach. Every year MDI spends $75+ million on energy – most of which is exported to out-of-state fossil fuel producers. MDI consumes 94,704 megawatt hours of electricity annually; photovoltaic panels put on every rooftop with good solar exposure could produce 85% of that peak load. A few hundred acres of solar panels could power the entire island. Read the meeting notes from the launch event here: Solar Group Notes and Other Alternative Energies Notes. 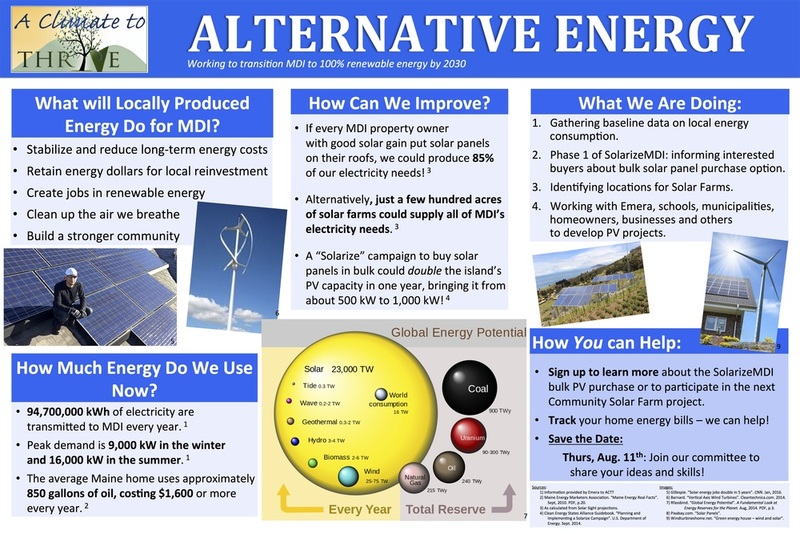 Ask about joining the Alternative Energy Committee that meets monthly.